Ah, St. Patrick’s day. The one day where boozing and sporting a green dyed mouth is completely acceptable and incredibly fun. There’s nothing more fun than rounding up your favorite people and embarking on a bar crawl in your town while sporting ridiculous amount of green. However, if you’re anything like me the idea of dressing up can be a little daunting. But just because you’re not rocking a crazy boa, a fluffy green tutu, or some shamrock printed frock (more power to you if you do rock out!) doesn’t mean you can’t partake in the spirit of the day! 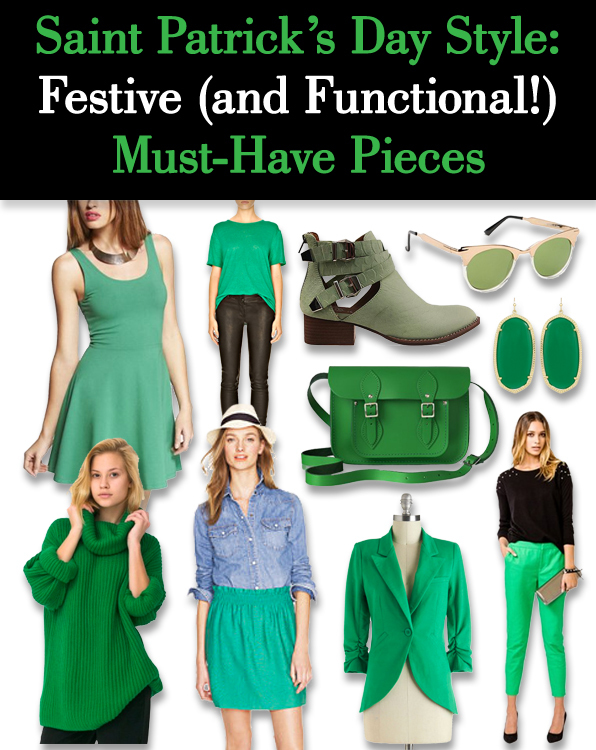 So with that being said, here are 10 awesome pieces that will help you get down with the luck of the Irish but that you can easily wear again! Forever 21 Essential Textured Capris, $19.80. Nothing screams St. Patrick’s Day better than a pair of bold green pants. Throw these trousers on and you’re ready to hang out with the best of the green dressed. For the day pair with a simple white tee (but beware of all that green beer flying around), or toss on with your favorite St. Patty’s day shirt to really go all out. 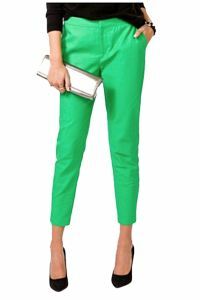 After the holiday, pair this pant with a feminine sheer neutral blouse, with a pretty printed top, or a chambray button down. Mod Cloth Fine and Sandy Blazer in Grass, $59.99. 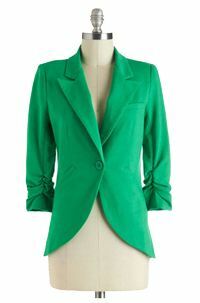 A green blazer is another great way to get into the SPD spirit. Again, pair this with a crazy festive shirt or with a boyfriend style t-shirt and a pair of your favorite dark skinny jeans and you’ll be looking like one amazing bar crawler. This is also great to rock after the festivities by incorporating into some your favorite looks. Express Stretch Cotton Skater Dress, $39.90. Such a great spring dress and even better for looking fantastic and festive for SPD. This perfect little dress will look great paired with a light denim jacket (or vest if you live somewhere warm), a great pair of ankle booties, some fabulous statement jewelry, and a great little skinny belt (brown or gold would be fitting for the day). This dress will get you through your spring and summer events, as well, and will look great paired with a blazer (white, black, and navy work well or you can even try colors and prints, too), again I mention denim jacket or vest, or a cute cardigan layered over for chilly nights. Throw on anything from flats, to wedges, to pumps and ankle booties and you’ve got yourself a fabulous look outside of St. Patty’s! Jeffrey Campbell Everly in Green Snake, $209.95. Ok, so green isn’t your color? Don’t fret – you can still get festive with a great accessory and this shoe just happens to be one. What I like about this shoe is that it’s not overly green so you don’t look like you’re rocking leprechaun shoes every time you wear them, but they’re perfectly bold and fantastically festive to get you through your day without coming off as anti-green. 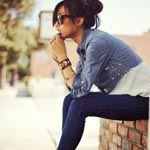 And you can pair these with just about everything – your favorite denim (printed, dark, light, white, colored), skirts, dresses, trousers – you name it these shoes will most likely work with it. Spitfire Anglo Dos Sunglasses, $39. Another way to add a touch of green to your day. If you’re day drinking and it’s sunny outside, sunglasses are an essential so why not get in the SPD mood with a pair of green shades. The green shades are not only noticeable but also kind of aviator prep and the gold metallic and Lucite frame is a fab touch. They’re a billion times more flattering than the crazy pairs they pass out at the bar, but they’re also a pair that you’ll get plenty of use out of in your day to day. 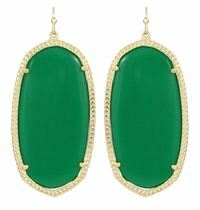 Charmed and Chain Danielle Earrings – Green Onyx, $60. Another great way to add some green to your holiday look is bold, statement jewelry. These green onyx earrings are a great way to add some of the festive hue to your outfit without getting way into the green theme. And what’s even better about these is that you’ll get plenty of use from them throughout the spring and summer. If you’re not into the earrings, try a statement necklace or some awesome green bangles. Cambridge Satchel The Classic in Green, $156. Yes, more accessories! If you’re a bad kind of girl, then this seems like a great time to invest in a new colored option for spring. Green bags are bold, but work well with so many different styles and looks so it will fit perfectly into your wardrobe. Try something cross bodied for a more comfortable, hands free fit what will look great slung over your favorite spring maxi (or any of your favorite looks). American Apparel Unisex Oversized Fisherman Turtleneck Sweater, $135. 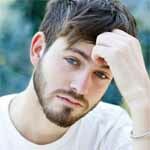 Sweaters are still spring weather attire so why not invest in a fun, comfy one for days and nights when a coat is just too much but a light shirt or tee just isn’t enough. This sweater is sure to make you look as festive as the next bar crawler but you’ll also look incredibly fab while drinking those pitchers of green beer. And the best part? You spill some of that green beer on this and you’ll most likely never see it (hey, we all know a little spillage happens sometimes). After the festivities you can pair this with your favorite denim (try mixing with colored – pastel blue or pink if you’re daring), rock with some floral printed pants for work, or add a touch of femininity with a flowing maxi or a-line skirt. Alexander Wang Linen & Silk Short Sleeve Tee, $98. St. Patty’s can be a LONG day sometimes so if you’re worried about comfort or aren’t really in the getting super dressed up, a simple tee can be just the thing. Alexander Wang tees are AMAZING and this is the perfect easy piece that will take you all over town on your day of celebration in the spirit of SPD. Once you get back to reality, you will find you can wear this with everything. Layer over a chambray top, experiment pairing with different printed and colored bottoms, pair under a denim jacket or a classic blazer – this is one fantastic tee that will get you through anything. J Crew Crinkle City Mini, $49.99 (on sale) – (If you order before Mar.15, use promo code GOODNEWS for an additional 30% off) Another great way to show green pride on March 17 is to wear a comfy yet stylish skirt while running around town. This skirt is incredibly easy to wear with its easy, loose fit and elastic waist band and it can be styled in a ton of different ways. Pair with a chambray or denim top (like they do in the picture), a cardigan and some cute flats for a more prepped out, classic look. Or try rocking with a boyfriend-fit tee and some bold ankle booties or motorcycle-style boots for a more edged out look. This skirt is great for everyday wear, too, to get you from work, to night, to weekend making it a great investment for St. Patrick’s Day and beyond. Whether you’re looking for additional pieces to add to your already thought out look or you’re looking for something festive without going over the top, these are 10 pieces that will get you looking ready for the big green celebration and keep you looking fab after. And regardless of how you decided to frock out, have a fabulous day and remember to drink and party responsibly!